A new embedded HTTP server is designed and implemented in V19 to replace previous server to provide higher performace and better structure. It is a tradtional PBX service. Please refer to the service document for more details. Some system features are optimized. V19 is recommended for all new VoIP deployment. 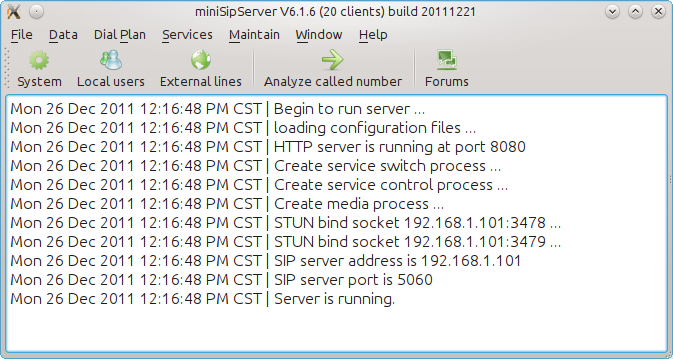 Upgrading from all other versions of miniSIPServer is optional. With the latest V32, miniSIPServer will not support this feature. Please try to run miniSIPServer in windows auto-start methods. If you have tried miniSipServer on Windows platform, you can find it is so easy to configure or manage a IP-PBX because miniSipServer provides a perfect GUI interface. You can find it is very easy to do that on Ubuntu/Linux because miniSipServer can support GUI interface on Ubuntu/Linux now! WINE is unnecessary now! After you download .deb file from our website, please click (or double-click) it to install MSS. No more actions! So easy, so funny. After you finish your install, you will find miniSipServer at “Applications / Internet” group. In another way, if you just want to run a command line sip server, you can also go to directory “/opt/sipserver” and find “msscli” which is a command-line miniSipServer and has the same core with GUI-miniSipServer. You can manage and configure it through web interface. We upgrade cloud-miniSipServer to support “Dial plan” features. Customers can use these features to control the calls very flexibly. When you sign in your account, you will get “Dial plan” features in command list at the left side . And the trial duration of each call for trial accounts has been upgraded from 30 seconds to 60 seconds according to most customers’ requirements. Please enjoy it and have a good day!